Something magical happens every Sunday in northern Seoul. Korea’s growing Filipino population come out and create what some call “Little Manila” on the sidewalk near the busy streets. Some say that it actually is like a snapshot of Manila itself. Gorgeous, huh? These are not just any sausages. They’re longanisas. Sweet. Garlicky. Pork fat!!! Actually they’re so full of pork fat that they’re difficult to cook without destroying your pan. But there is another option. You can eat them fully cooked yourself at the food stand that sells them. I don’t know what it all is, but I do recognize a lot of pork, and that is a good sign. A plate of rice and three choices goes for 5,000 won. Check it out! Clockwise from rice: some spicy peppery pork dish thingy, little savory meatballs, two longanisa sausages (I looked that one up on Wikipedia). The Filipino market also carries live fishies that are not commonly found in Korea, I guess. And I haven’t seen long beans at my local E-Mart. Even though the bottled and canned goods primarily cater to homesick Filipinos, there are a few items that I have heard Western ex-pats pining for, like corned beef hash and tinned sardines. And for you Southerners out there, here’s where you can get your fresh okra fix. I know we’re on the cusp of winter now, but I took these pics in the midst of summer. 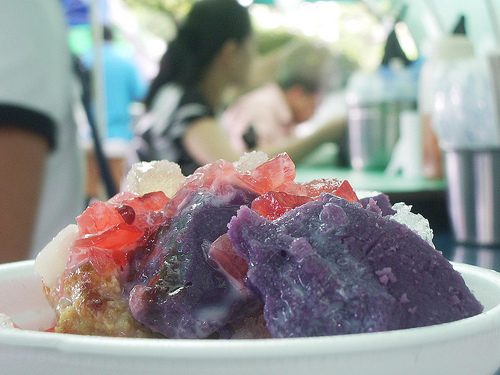 One of the most popular treats to come out of the Philippines is halo-halo, which is shaved ice with different jellies, fruits and purple sweet potatoes. It’s like Korean patbingsu. This wonderful lady shaved the ice by hand from a big block using something like looked like a wood planer. She also sold me a string of those glorious longanisa sausages and cautioned me on how to cook them at home. The trick is to do it slowly and to take precautions to keep a black crust from permanently attaching itself to your pan. They’re very fatty, garlicky and sweet. Take the Light Blue Line (#4) to Hyewha Station 혜화 역. Go out Exit 1. Walk straight, and you’ll hit it. Here is a Google Earth bookmark to add to your collection. Fantastic. Next time I’m in Seoul I’m there. This is my first time hearing about a Filipino market in Korea. I am intrigued! Thanks for sharing these 🙂 Can’t wait to visit the next time I’m back on the motherland. Thanks Peepster. I’m just starting to educate myself on Filipino cuisine. I’ll remember that. Ohh man, I freaking love Longanisa even though it kills my pan! Seriously, i love it when it’s crusty actually and eating it with rice. The other filipino dish you have along with that looks like caldareta. I enjoyed this post a lot! Oooh. Pinoy food. “Sarap” (Delicious). It is best if longganisa would be heated in water first so the pork inside would be pretty cooked. And then just wait for the water to vaporize, just in time also for the sausage to make its own fat and immerse itself into it. mmm, i’ll have to head back there sometime soon. i like to wrap my pan in tin foil before cooking the longanisa. oh, and they have root beer at Little Manila too! Oh joy! I’m sooo glad to read all about the Filipino Sunday Market in your blog. I wish I was there to try out ALL the Pinoy food. I’m Filipino born and raised; I love all kinds of Asian food. And latest food craving I have is all KOREAN. But my weakness is Pinoy food. Thanks for making me happy. Happy Thanksgiving! It doesn’t harm even if it’s not celebrated in Korean, right? Longganisa is spelled with two “L”s. There are different types: sweet, savory, garlicky, etc. Ask if they have Vigan longganisa or Lukban longganisa. The amount of fat and garlic is mindboggling (don’t kiss a vampire after eating). But is it sooo good. Recommended to eat with garlic fried rice with a dish of vinegar on the side to dip the sausages in. If I am not mistaken, the peppery pork thing you had is adobo. Adobo is the Philippines’ national food. It is quite easy to fix (I’ve blogged about it). If it is not adobo and you think there’s tomato sauce in the ingredients, it can be caldereta or mechado. PS. Longganisa can also be homemade. I cna share the recipe if you want. Shoot! I meant Longganisa with two “g”s. Slaps forehead. Duh!